It is sometimes the case that a favorite writer isn’t terribly interesting when it comes to talking shop. 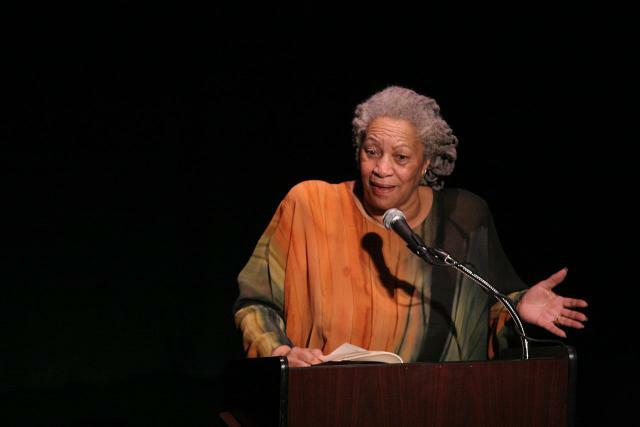 This has never been so with the self-revealing Toni Morrison, whose public appearances and interviews often duplicate the experience of reading one of her novels—her voice draws you in, and before you know it, you’re part of a world all her own that she has given you the privilege of joining for a short time. A good editor is “like a priest or a psychiatrist.” Morrison worked as an editor for Random House for 20 years before she published her first novel. She observes the relationship between writer and editor by saying that getting the wrong one means that “you are better off alone.” One of the marks of a good editor? She doesn’t “love you or your work,” therefore offers criticism, not compliments. Plot is like melody; it doesn't need to be complicated. Morrison sums up her approach to plot in Jazz and The Bluest Eye by saying “I put the whole plot on the first page.” Rather than constructing intricate plots with hidden twists, she prefers to think of the plot in musical terms as a “melody,” where the satisfaction lies in recognizing it and then hearing the “echoes and shades and turns and pivots” around it. Most readers of Morrison’s work would argue that’s exactly what she’s done her whole career. Read the entire interview here and be sure to visit the complete archive of Paris Review interviews online. I love reading about Toni Morrison’s writing advice. A quick question from the editor. Can anyone tell us which Facebook page promoted our post today? I find the writing advice very interesting and timely especially this statement: “making a little life for oneself by scavenging other people’s lives is a big question, and it does have moral and ethical implications.” I am struggling with a character whose traits were triggered by someone I know. Great post. Promoted by Geneva Writing Group Facebook page. Hello I am a new writer and this has helped thank you. Loved this article. So on point!!! I just saw this site for the first time. Seeing Toni M’s words was great, but my god, such an overdose of male names on the’index’ page. Enough already with such imbalance!